Saving For Your Future » Pensions » Moneyfarm pension review – are they the best pension choice? Moneyfarm is one of a new breed of robo-advisers which manages clients' investments in a low cost and simple to understand manner. It achieves this by using exchange-traded funds (ETFs). While it uses passive investments, the Moneyfarm investment portfolios are managed on a discretionary basis (i.e Moneyfarm makes the investment decisions for you) via an investment team which provides a tactical oversight. Unlike some other robo-advice firms Moneyfarm also provides online restricted financial advice when you choose a portfolio. In order to provide an independent Moneyfarm pension review, I not only registered for an account online but have also visited their offices to see how their Chief Investment Officer and his team invest clients' money. As one of the most widely quoted investment experts in the national press this was always going to be a key consideration of mine when reviewing Moneyfarm's pension product. I also want to make you aware that because I feel the Moneyfarm pension may be attractive to many people I therefore secured an exclusive offer for MoneytotheMasses.com readers that means Moneyfarm will give you a free bonus of up to £100 when you sign-up for a Moneyfarm pension, or transfer an existing pension to them. In the interests of transparency, I receive a small fee from Moneyfarm if you utilise the offer. However editorial independence is paramount to MoneytotheMasses.com and in no way is this review or my views ever influenced by 3rd parties. I have included a link to Moneyfarm at the foot of this article which you can use and MoneytotheMasses.com will not receive any payment from your referral. How does a Moneyfarm pension work? Moneyfarm builds and manages a pension portfolio for you that aims to meet your retirement goals. The product is a target date pension, which means your portfolio is regularly rebalanced by Moneyfarm to maximise your investments and track of your financial goals based on your chosen retirement date and risk attitude. Each Moneyfarm pension is created by offering online regulated investment advice and a discretionary management service. Rather than having to make time on the phone or to visit a financial adviser in their offices, the whole Moneyfarm process is managed online. All you have to do is answer an online questionnaire that will help determine your risk appetite by assessing your goals, time horizon, financial situation and attitude to risk. Before your portfolio is set up you will also need to give an indication of how long you want to save for, i.e when you want to retire. You will then be recommended a portfolio of exchange-traded funds (ETFs) built and run by its team. You don’t need to worry about the funds you choose or particular regions or sectors as this is all managed as part of the discretionary management service. Once you have been recommended a portfolio based upon your user profile this recommendation is reviewed at least annually by Moneyfarm. On each anniversary you will receive an alert to update your profile and risk questionnaire if you haven't done so during the year. 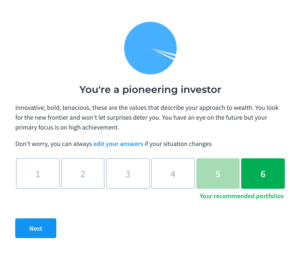 Moneyfarm will then tell you whether your current portfolio is still suitable or whether you need to change to one of the other five portfolios in order to reduce/increase the investment risk you are taking. The combination of using a target dated pension alongside financial advice means that as you approach retirement Moneyfarm will naturally recommend that you take less investment risk ahead of you accessing your pension. This de-risking is referred to as 'lifestyling' within the financial planning world. While there is a manual (rather than discretionary) element to Moneyfarm's process in that you have to accept their new recommendation it is a form of lifestyling nonetheless and I don't quite understand why Moneyfarm doesn't highlight this in their marketing. It is a big positive from my viewpoint. Much press coverage, and even the search results for 'Moneyfarm pension', refer to the Moneyfarm pension as a self-invested personal pension (SIPP). But this to my mind is incorrect as a full SIPP usually lets a saver choose and manage their own investments from a wide choice of fund providers. Moneyfarm only offers ETFs and chooses them for you, making their product more of a personal pension scheme. Whatever you call it, you will still be getting the benefits of tax relief on pension contributions and the ability to access your money from age 55, should you wish to buy an annuity, enter income drawdown or just keep investing for your retirement. You can transfer existing pensions into a Moneyfarm pension for free and in addition, Moneyfarm will cover any transfer-out charges. How does Moneyfarm invest your pension? At Moneyfarm, your pension is built with exchange traded funds (ETFs) to keep your investments low-cost and transparent. All Moneyfarm users, whether via its general account, ISA or pension, are assigned a portfolio based on a level of risk. But before you are given your portfolio, Moneyfarm needs to get an idea of the type of investor you are. 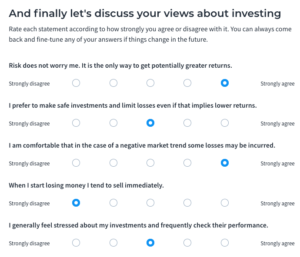 It uses a questionnaire (as shown below) that assesses your risk aversion, income and financial situation as well as other psychological characteristics that influence your relationships with investments, such as your attitude to risk and reward and losses. You can retake the questionnaire if you are unhappy with the result. At this stage, Moneyfarm used to present the breakdown of the corresponding portfolios on screen but you are now encouraged to continue to full registration. If you are interested in seeing the asset allocation of your recommended portfolio then you can simply check this on Moneyfarm's website, as it is easily accessible information. You can build a portfolio for free yourself using Moneyfarm's portfolio tool without committing to the service. Registering is free and there is no obligation to invest any money. 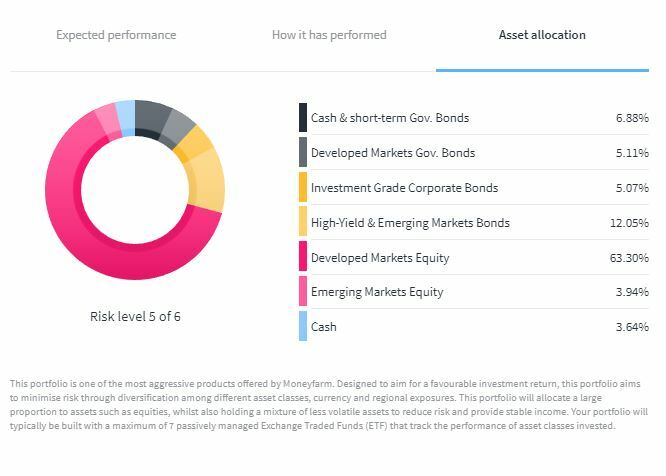 There is plenty of debate over active and passive management, but Moneyfarm has made that choice for you as all its portfolios are made up of exchange-traded funds, covering a mix of asset classes, regions and sectors depending on your level of risk. If you invest up to £50,000 your portfolio will contain up to 7 funds, if you invest over £50,000 you’ll have up to 14 funds. There are advantages to ETFs as they are lower in cost compared to actively managed funds so more of your money goes towards returns and they are fully transparent so you know where your money is invested. There is a downside though as you will only ever track an index that an ETF is replicating, rather than beating it, which an active fund manager aims to do (although admittedly seldom does). The whole Moneyfarm service is managed and tracked online but you can also speak with Moneyfarm’s investment consultants to discuss your options if you need to. After the questionnaire, you need to set up your contributions and retirement date. You will be able to see how each portfolio is set up (an example is shown below), what your likely returns could be based on, how much you are planning to save and your risk level. This will help you decide if you need to invest more or adjust how much risk you want to take. All these details can be changed at any point. As mentioned earlier, your portfolio and suitability will be reviewed annually by Moneyfarm so you can assess if it is still on track to meet your goals - much in the same way that a financial adviser does. Once you are happy with your portfolio, you can invest money or transfer an existing pension across to Moneyfarm (more on this later). Once your money is invested into your chosen portfolio then Moneyfarm will manage the portfolio and select the underlying ETFs. The portfolio is rebalanced 3-4 times a year to minimise costs with the investment team providing the tactical oversight on their quantitative investment models. The investment committee meets monthly, although the team continually evaluates the portfolios. My sense from discussions with their Chief Investment Officer is that Moneyfarm place as much emphasis on risk management as they do with optimising returns. While this was a slight drag on Moneyarm's portfolios in 2017's equity market rally it meant that its portfolios held up well during the stock market sell-off in the spring of 2018 and so have outperformed their biggest rivals since Moneyfarm has launched. Later in this article I look at Moneyfarm's performance in more detail. 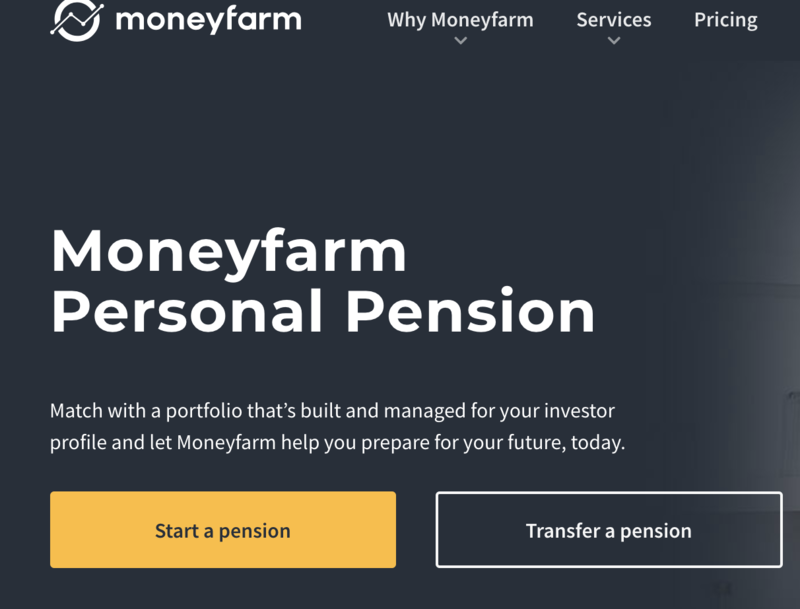 Does Moneyfarm’s pension have a minimum investment amount? Moneyfarm used to have a minimum investment of just £1, which made it a pretty attractive way to start saving for your retirement. But in July 2018 it changed this to a lump sum of £500, which can either come from yourself, a pension transfer, or from your employer if you can persuade your boss to contribute. If you want to set up a direct debit, you’ll need to set up a monthly contribution of at least £100. Beyond this, Moneyfarm lets you set your own contributions, subject to its minimum, but suggests starting with £1,500 to help diversify your risk. Remember, the more you regularly invest – while not breaching the annual and lifetime pension allowance - the more you are likely to benefit from pound cost averaging, hopefully boosting your profits and retirement savings. The amount you invest also determines how many funds you will have in your portfolio. If you invest up to £50,000 your portfolio will contain up to seven ETFs, if you invest over £50,000 you’ll have up to 14 funds. Can an employer pay into a Moneyfarm Pension? Employers can also contribute to a Moneyfarm Pension for their staff. You will need to request a form from Moneyfarm and get it completed to set up the contributions. You can transfer pensions from other providers to Moneyfarm, including from SIPPs and workplace pension schemes, so long as you haven’t started to take income from them. Moneyfarm lets you transfer for free but there may be exit fees from your old provider. Moneyfarm will cover exit fees up to a maximum of £500 per customer when you move your investments to them (subject to a minimum investment of £5,000). Moneyfarm pension drawdown - what happens to my Moneyfarm pension when I retire? Moneyfarm doesn’t just help you build up your pension savings, it also helps when you enter retirement. You can start withdrawing your funds from age 55, or older, using Moneyfarm pension drawdown. This is a form of income drawdown that lets you keep some of the money invested while withdrawing a set amount each month. Moneyfarm doesn’t charge any extra for income drawdown beyond its usual platform and fund fees, while other pension providers or platforms may have setup costs or extra admin charges. 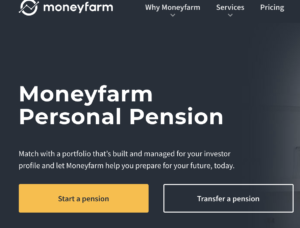 The reality is that Moneyfarm does not yet have an income portfolio, again like most robo-advice firms, which would ideally suit a pension in drawdown. So instead you would need to withdraw lump sums from your pension pot in retirement. This isn't ideal as it can mean having to encash a larger percentage of your pension in a falling market if you want to maintain the level of income being taken, in terms of pounds and pence. However, there is nothing stopping you moving your money to another provider at this point and building your own income portfolio. Another retirement option is taking an annuity, however, Moneyfarm does not provide this so you would have to transfer your funds to a new provider. Moneyfarm doesn’t charge any exit fees so you would be able to do this, or even find a different income drawdown provider, at no extra cost other than what the new provider charges. Moneyfarm fees are the same across all its accounts (pensions, ISAs and general investment account) and if you have multiple portfolios such as a pension and ISA you would pay just one platform fee. Investors pay 0.7% on the first £20,000, then 0.6% on any amount from £20,000 to £100,000, 0.5% on anything from £100,000 to £500,000 and then 0.4% on funds above that. There is also an average fund fee of 0.3%. For example if you were to invest £210,000 you would pay 0.7% for first £20,000, 0.6% on £80,000 and 0.5% on £110,000. Fees are charged on a monthly basis but are calculated daily based on your portfolio value. However, you can get half price management fees in the first year on up to £15,000 by visiting here. Moneyfarm launched in the UK in 2016 so has three years of performance data. Assuming an investment of under £50,000, Its lowest risk level 1 conservative portfolio product, which invests solely in bonds and commodities, has returned 8.2% since January 2016 or 2.4% annually. Level 2, or the focussed portfolio, starts introducing equities alongside the bond exposure and has returned 13.1% since January 2016 and 3.8% annually. Those in a level 3 driven portfolio will start moving up the risk scale with equity exposure overtaking bonds. This approach has returned 22.5% over two years and 6.5% on an annual basis. Equity exposure is increased further in level 4, dubbed the exploring portfolio, with an increasing focus on areas deemed more risky such as emerging markets. This portfolio has returned 24.3% since January 2016 and 6.9% annually. Risk level five, described as adventurous, starts to drop the bond exposure, shedding inflation linked products and shifting from the UK towards emerging market, Japanese and US equities. Investors have seen returns of 26.8% so far in this portfolio or 7.5% annually. The highest risk portfolio, level six or pioneering, has no bond exposure and has the largest weighting to emerging markets and the US. It has returned 29.2% since January 2016 and 8.1% annually. Check out our Moneyfarm review where we look at the robo-adviser’s pension performance in more detail versus Nutmeg, the most well-known robo-adviser. Moneyfarm’s closest robo-pension rivals are Wealthsimple, Nutmeg and PensionBee. All start from similar places, asking users about their retirement goals, but differences emerge when it comes to the minimum investment and choice of portfolios and service you end up with. The lowest minimum investment of the three is Wealthsimple, you can start your retirement savings for just £1 compared to £500 with Moneyfarm and Nutmeg. PensionBee doesn’t have any minimum but you can only get one of its portfolios by transferring existing pension savings. You can read our separate Wealthsimple review, Nutmeg review and PensionBee review for more information. There is plenty of variety in Moneyfarm’s six portfolios, whilst you get nine with Wealthsimple and four with PensionBee. However, you get 10 portfolios with Nutmeg. All four providers offer low cost ETF or tracker fund portfolios. Nutmeg has two fee structures. Its fully managed portfolios (comparable to Moneyfarm's investment portfolios), which are proactively managed to protect against losses and boost returns charges 0.75% up to £100,000 and 0.35% beyond that. It also offers fixed allocation portfolios, designed to perform without intervention. These charge 0.45% up to £100,000 and 0.25% beyond. Nutmeg’s portfolios have a fund fee which averages 0.19%. Wealthsimple charges an annual fee of 0.7%, although this is reduced to 0.5% if you have investments worth over £100,000 or you can get your first £10,000 of your money managed for free for the first year via this offer. PensionBee’s charges depend on the portfolio as well as how much you invest, with fees coming down on amounts above £100,000. For pensions under £100,000 you'll pay annual fees of 0.5-0.95%, depending on the portfolio. The costs are halved on values above £100,000. All allow transfers from other providers, but PensionBee’s service goes a bit further as it will also help you locate your pension. This makes it stand out as a decent pension consolidation service, particularly as you can only get started by making a transfer. In comparison, Moneyfarm lets you start a new pension or transfer old funds and has one simple to understand pension product. The Wealthsimple service works along similar lines to Moneyfarm but has lower entry costs at £1 rather than £500. Nutmeg has the same entry cost as Moneyfarm, but you will get a wider choice of portfolios. MoneytotheMasses.com readers can also take advantage of our exclusive offer where Moneyfarm will give you a free bonus of up to £100 when you sign-up for a Moneyfarm pension, or transfer an existing pension to them. Moneyfarm is now one of the more established names in the robo-adviser space. Its performance data only stretches back to 2016, compared with the five-year track record that you can get with Nutmeg. However, as shown in our wider Moneyfarm review (which also looks at the ISA product) Moneyfarm has outperformed Nutmeg since inception in the portfolio I analyse. 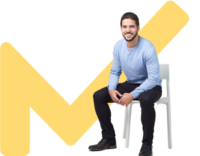 The Moneyfarm platform is easy to use and the setup process is fast, although it is a bit clunky if you want to drastically change your risk level after your first assessment. Once you complete your questionnaire and setup contributions you can change your risk level by one, such as going from a six to a five or vice versa, but if you wanted to reduce or increase any further you then need to create a whole new portfolio. There is plenty of choice in the six portfolios, giving you exposure to a broad range of assets, and while £500 may sound like a lot to start with compared with the £1 it used to offer, you are only going to get a decent retirement income by investing as much as possible.